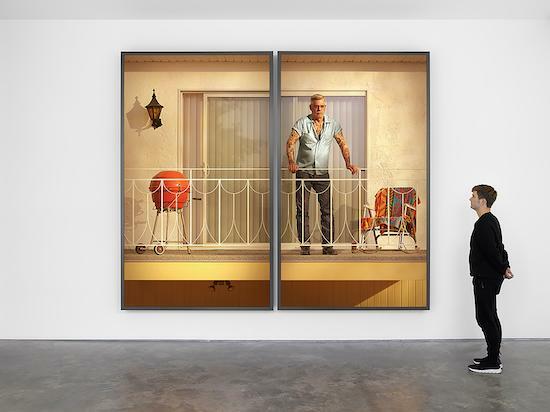 Rodney Graham is definably an interdisciplinary artist, examining nuances in cultural and historical threads across a variety of media, including performance, music, sculpture, painting and video. Living and working in Vancouver throughout his career, Graham studied under Ian Wallace and Jeff Wall during the beginning of the Vancouver School's conceptual photography movement. Initially influenced heavily by their work, he soon branched out into his own aesthetic territories. Graham's work inhabits the space between artist, performer and observer. He provides insight into social and historical cultures through often humorous depictions of the tropes he witnesses. 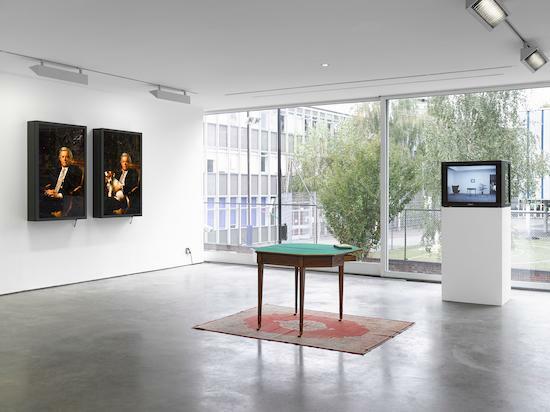 This interview takes place during a tour of his recent solo show Central Questions of Philosophy at Lisson Gallery in London. The exhibition (open until November third) explores the nature of the artist as a creator, performer and as a sort of culture-sponge. An envoy for ephemeral ideas, artefacts or symbols that filter down through communication – eventually becoming ubiquitous in our language and collective imaginations. Through a series of light box works, Graham is photographed playing characters. These range from an ageing rockabilly fan in Vancouver through to famed gallerist Samuel Kootz and philosopher AJ Ayres. The key tenet linking these figures together remains the decision of the artist to inhabit them in some way. 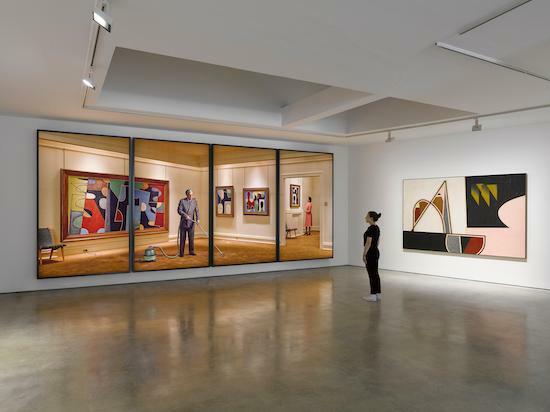 The walls surrounding the brand new series of light boxes entitled Vacuuming The Gallery, 1949 are surrounded by paintings made by the artist as he performed the actions of an artist working in 1949. Graham's works involve layers within layers, both figuratively and literally. The transparencies on the previously mentioned light boxes are made up of countless photographs of carefully staged sets. The conceptualism Graham learnt during his education in British Columbia carries throughout this new exhibition. The reasons for the work may not always be initially clear, but the conversations found in them are myriad. the one with the blue stripe on it? Terrible cover. It reminded me of Gang of Four, or Magazine or something in that wheelhouse. You guys toured together, right? With Gang of Four? That was awesome. They were really good, really cool people as well. I saw Dan Higgs recently in Leeds. Do you know his music? It seems like something that you'd be into. Yeah, I actually have an indirect connection to him. I actually did a piece that relates to one of the works in this show [Tattooed Man On Balcony, 2018]. I wrote an open letter to a tattooer describing a tattoo that I wanted on my back, the poem is written with the text cascading across the page. The tattoo was of Popeye in a deep-sea diving suit with a helmet on blowing bubbles through his pipe, fighting a giant squid. The squid is fighting back and spraying black ink everywhere and it’s going up my back and over my shoulder. I gave the poem to a tattooer to get the flash drawn up with the intention of showing the flash alongside the light box work, but decided not to. The guy who drew the tattoo flash had actually studied under Dan Higgs, from Brooklyn or something. I knew Higgs’ music a little bit, I have a record of him doing Banjo improv. I never really knew about Lungfish until I got this record, but it’s funny that he was also important in the tattoo world. Yeah, he’s like Thom De Vita. They were just artists working through tattooing. Dan Higgs is still just touring, doing his thing. It can almost be a guided meditation. He does this weird preaching thing too, right? A friend of mine releases a lot of his stuff, Bill Mace. Daniel Higgs has actually come up before. We could go on… Let’s talk about Vacuuming The Gallery, 1949 (2018). This one is based on a photograph I found on the internet of a gallerist in his gallery in 1947 - this guy called Samuel Kootz. I didn’t really know anything about him but it turned out he was an important figure in promoting abstract expressionism in the forties and fifties, he did the first US show for Picasso post-war. I wanted to do a piece about a gallery with paintings because I like having an excuse to make paintings. I made this piece specifically for this wall [at the Lisson]. It’s as big as I can make these light boxes. That’s what determined the structure. I made this four panels – my biggest yet – with the intention of making it more immersive. I made the paintings in it based on a Rodchenko drawing. They’re all extrapolations of it. These look nothing like it. I just took the image from the internet and started cutting it up and pasting it back together then photographing that and repeating. This is kind of a continuation from The Gifted Amateur, Nov 10th 1962 (2007) exploring modernist values in painting. I was including sand in the paint in order to create this texture - something that they also used in the forties. I wanted their texture in the lightbox to be very clear, because the photographs are made up of hundreds of images it requires something like this to bring out a strong texture with the light coming through. I remember hearing you discuss switching from film to digital and the realisation that through using this medium you could pack your work full of so many more details. The depth here almost makes the room start to flex when you look at the difference between the angles in the images and the angles in the room. It’s something I wanted to discuss with you, the idea of coming from a conceptual background and needing an excuse to make paintings. The idea that once you subscribe to having a strong conceptual language, you need to justify painting, to give yourself a reason to do it? That’s something I can personally identify with. Yeah, that’s something that came from my teachers – my friends, Ian Wallace and Jeff Wall. Being a couple of years older than me, they had passed through that painting phase naturally. When I started at the University of British Columbia, it was Photo-Conceptual. Conceptual art was the main focus. I come from a slightly literary predilection so that was galvanising to me – the possibilities of art from a conceptual perspective. I didn’t go through a painting phase, it was only later that I began looking at painting. I was always more on the Duchamp side than Picasso. It took a long time for me to start dabbling in painting but it’s something I very much enjoy doing. Are you a painter? No, I started out as a painter but my own work is conceptually focused, mostly audiovisual and installation. I started as an abstract painter but one day I just couldn’t do it anymore, it just felt pointless. I totally identify with this idea of needing to create a justification for doing something. I thought something that you’d said before about moving from being anti-studio to someone who is never away from their studio was interesting within this context. It’s almost performative in itself, like having a studio is a justification of being an artist because you are in your artist’s studio. Almost like when you’re in your studio you’re performing as an artist? Yeah, having a proper studio changed things completely for me. I kind of took pride in doing stuff in my living room, sending specs out to have sculptures made or whatever. Just having a studio changed things. There is a performative aspect too. Also a practice space for music or whatever. I love doing music, it’s like a super serious hobby. Could you tell me more about the actual paintings as well? I was hesitant to put the paintings in the room with the light boxes. It’s hard to pair the light boxes with other things. I could see that. They’re very dominant pieces but I feel like the inclusion of the physical paintings do add to this feeling of a gallery within a gallery. It ties the experience together. The weird open angle in this room creates a weird continuum panorama. It opens up with the wall that the paintings are on. It’s also at odds with he angles of the room in Vacuuming The Gallery. It creates a sort of distortion. It initially looks like the paintings in the images and the paintings on the actual walls are the same. As your eyes switch between them you notice the angular dissonance between the two spaces – something interesting when you’re in a gallery looking at a fake gallery that actually was a real gallery full of fake paintings that are actually real paintings. It’s an unusual framework in which to parse an exhibition. These light boxes and the paintings around them had me thinking about the work in terms of texture and application and line, something that I wouldn't be immediately drawn to in general – but at the time when the fictional artist made these works, these were almost the the be all end all in discussing painting. It’s interesting that these works shifted my critical perspective. It re-contextualised my thinking within the space. Your performing as the artist in the 1940s gets me performing as a viewer within the 1940s. I also wanted to maintain this domestic feel. A lot of those 57th Street New York galleries were just converted apartments. You can see the filled-in fireplace in the fourth panel. In the actual photo of Kootz, he’s sat in the corner smoking a pipe. I wanted to change it because I think there’s something very self-satisfied looking about smoking a pipe that goes well with the vacuuming. I liked the way that the vacuum flowed across the first three panels. The formal aspect of making these things is really fun. I’m dealing with very determinate divisions in terms of what size the boxes can be so I like to play with them in some ways. Looking at the suit and the pipe with the vacuum, I kind of saw it as a control thing. This is my gallery, I made this happen and it’s up to me to make sure everything is correct. Abstract expressionism was a very serious time. This seems like the kind of thing that would have happened. I never thought of that. He’s almost manspreading across the space, taking up so many of the panels with the vacuum cleaner. And the next piece is Tattooed Man On Balcony? This piece came out of the Mallarmé poem cascading across the page and the tattoo idea that we were talking about earlier. I liked the idea of getting a lot of these Popeye universe characters made into temporary tattoos, putting them on this rockabilly guy who was obsessed with this old school kind of tattoo. I liked the style. It was very bold. Also, this kind of architecture is something that you see in Vancouver a lot, this suburban style – sometimes called the Vancouver special. This house is based on a sort of 50s or 60s bungalow that’s very common in Vancouver. I guess it also looks kind of like an apartment in Miami. He has his barbecue here, he’s into a sort of retro vibe. I just wanted to explore this character that is present in Vancouver and I suppose, across North America. Similar to the aesthetic presence of the next piece. [Screen Door, 2005] Yes, you had this cast in solid silver, right? R: Yeah, it was made before the crash. There was this auction of Elvis memorabilia where they were selling some really funny stuff: top loading VCRs with monty python videos, his Texaco card, his golf cart – all this unusual stuff. One item was the screen door from the back of Graceland. It was aluminium. I totally kicked myself for missing the auction. It was re-auctioned recently and I missed it again. This piece is based on it. I had to work from photographs and I got some screen doors from Vancouver for reference as well. This sort of door is ubiquitous across North America. I really wish I had the Elvis one to see if I managed to get it exact or not. Is there a relationship between these two pieces? The idea of replicating classic Americana as it becomes less prevalent? Not really, it was just something I was used to seeing around Vancouver and thought of it as being a beautiful object. It’s not something I often do, seeing something and having it made in solid silver but I wanted it in the show because of the smaller piece upstairs [The poker table featuring a silver slipcase containing a copy of Robinson Crusoe]. This is sort of atypical of my work. This was one of the pieces that I had the most trouble with figuring out, compared to the light boxes, there really aren’t so many clues as to what you’re looking at. Like the table upstairs? The table upstairs actually relates to a lot of the earlier work that I was making. I worked a lot with a publisher friend of mine in Belgium, choosing a book and making a sculptural slipcase for it. It goes back to my earliest work, I actually conceived it about twenty years ago. I wish that I had the original drawing, I gave it to him and he said, I’ve found a really good book – this copy of Robinson Crusoe. It’s the first Arabic translation – in fact the first Arabic translation of a work of European fiction – kind of a rare book. The slipcase was actually made by his dentist. I wanted to display it on this sort of fold out Sheraton games table on top of this carpet, alongside the film. The mechanism of the slipcase is shown in the film, to preserve it. Could we talk about Unused Prop: French Telephone (2018)? Yeah, this piece is based on the Martin Scorsese film The King Of Comedy. There’s a scene where Jerry Lewis has a gun to his ear and to his other ear he’s got this gold telephone, wearing these aviator glasses. I originally thought it’d be fun to do it as an album cover for the record I’m always working on… I bought it online and it looks identical to the one in the film. It was just sat on this scuzzy table and I thought I’d take a picture. If you google ‘French telephone’ these photos come up for some reason. I don’t understand what’s necessarily French about it but there you go. I also wanted to ask you about the Smoke Break series [A series of photographic works in which Graham poses as different individuals on break]. I love the old punker one, it’s such a ubiquitous image within subcultural spaces. I have a theory about the series in relation to the Liberty Cafe [The cafe owned by Graham in Vancouver]. Owning a cafe is the perfect excuse to people watch. You end up with this battery of subjects to pull from just by being able to be there all the time. Did that have anything to do with you taking it over? Wow, that’s kind of creepy in a way. I do go every day and sit there every day. It’s all free for me, which is cool. The people watching is fun for me, yeah. I guess becoming a studio artist, this is a way for you to reintegrate with the cultures you’re inspired by? The observation of routine seems to be an undercurrent in your work. Well I actually came across the inspiration for this work Central Questions Of Philosophy (2018) on Twitter. Someone tweeted this picture of AJ Ayres. I was interested in it and discovered that there were two version of the cover obviously from the same photo session – one with the dog and one without. Although I read Language, Truth and Logic years ago, it's not directly about that. I was interested in the idea of the Philosopher with this animal but everyone thinks I look like some US Senator or something. I wanted to work with an animal. It ties in with the Robinson Crusoe work, using a dog. I wanted it to be pretty exact. I had to get this chair reupholstered with the flame stitch pattern and we had to raise the back up in Photoshop to make it match. The uncanny thing is, to keep them uniform, we used the same head. So my head was just Photoshopped off my shoulders and onto the others. The last piece in the show is called Black Tapestry (2018). It’s this record called Tapestry by Carole King. She was a hit songwriter in the 1960s along with her husband. She moved to Topanga Canyon to reinvent herself as a singer-songwriter and she released this album in the early 1970s. This album is kind of iconic for North American people my age. She’s sitting by the window in her Topanga Canyon pad in her 70s jeans and I just wanted to give it a goth vibe. I’d been doing work on vintage record covers for a while, experimenting using inks, making monochromes and just letting a little bit of the image poke through. You start pulling the ink from the cover around with the brush and it can look really interesting. Sometimes it sinks into the cover. The first edition was meant to look kind of like a watercolour on textured paper and subsequent editions were very different. It was a lot of fun to do and I liked the title Black Tapestry, taking Carole King and giving her this kind of goth or black metal vibe. I found some of them on eBay. They’re ubiquitous in thrift stores throughout North America. It’s one of those albums that you just see everywhere. That reminds me, did you see Mandy [The psychedelic horror film featuring Nicholas Cage] yet? Oh yeah, that’s from a Vancouver guy. I didn’t see it yet, I’m a bit of a wimp when it comes to horror movies. I could talk about Nicholas Cage all day but there’s something interesting about this in relation to the way you’re painting. You’re painting from this sort of place as the ‘Other’. I think painting is something that gives you a great deal of personal license to experience this subject matter. Any feelings that you had in relation to this record will be coming up over and over again, each time you make a new version. I suppose you must have developed an entirely new relationship with the music and the imagery. Any personal experience you had must have been magnified?